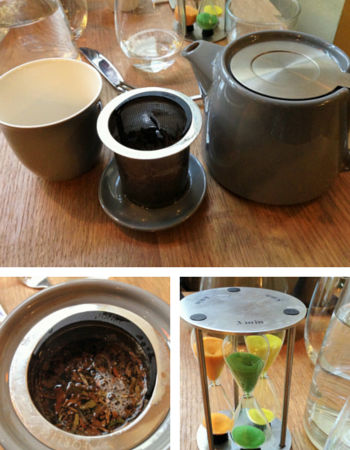 You are here: Home / Days out / Review: Waterloo Tea House, Cardiff. A genuinely nice place to eat! Review: Waterloo Tea House, Cardiff. A genuinely nice place to eat! I was recently invited to be a part of a ‘Guide to Cardiff’ that is being put together by Millennium Hotels. I was asked to visit anywhere that I wanted in Cardiff, somewhere that I loved. I was able to bring a friend along too so I jumped at the chance of taking my good friend Gemma to eat somewhere that didn’t serve typical ‘kids food’. We have nine children between us so going anywhere with just one little toddler is bliss! 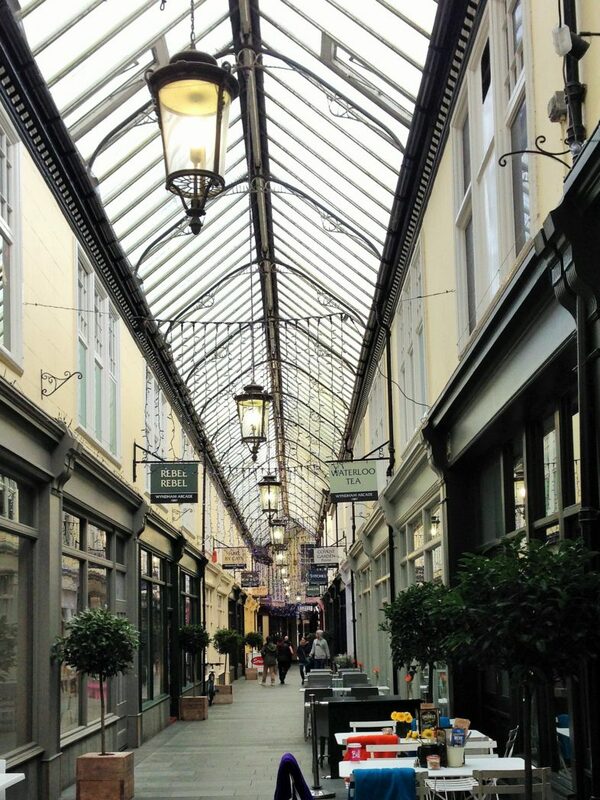 After a good think, I chose to go to Waterloo Tea in the Wyndham Arcade, The Hayes. Now I love a good cuppa, so the fact that Waterloo Tea has around a billion (okay I exaggerate slightly) varieties of tea on offer is like heaven to me. 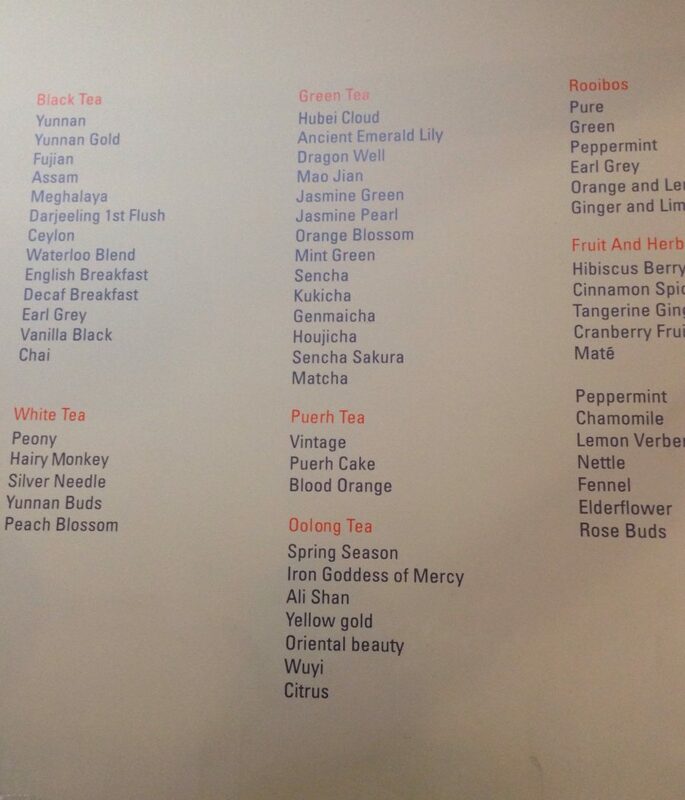 So far I have only tried the Rooibos (which I always manage to call roobios! ), the Cranberry Fruits and the Meghalaya (again, not so good with the pronunciation, megalions anyone?) but I am well and truly hooked and want to try them all, even if the Hairy Monkey one does sound a little scary! That’s one helluva lot of tea! We arrived at 11.20am, just before they finished serving breakfast. We could have opted to wait 30 minutes for lunch but when we saw the breakfast menu everything looked so yummy we just had to try some of it! Of course we also had tea. 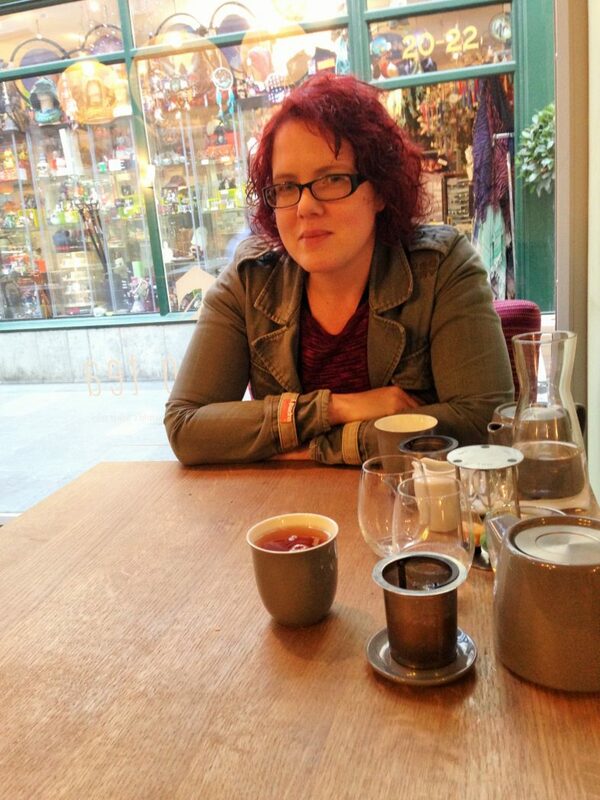 On recommendation, Gemma tried the Pure Rooibos as it can be drank with milk in and I chose the Meghalaya, which to me tastes like peach, but I’ve been assured it actually has hints of chocolate and caramel (I’d go with the experts’ taste buds if I were you!). Before we knew it our pots had arrived along with our own timer so we knew exactly when to take the tea out of the pot for the perfect brew. I really need to get myself one of these funky 7tea sets. The basket just comes straight out of the pots and you put it on the little tray (which I originally thought was a tiny saucer!) to catch the drips. You also get a good 3 cups of tea out of these pots which, when you compare it to other cafes is really generous. Our food arrived just a few minutes after pouring our first cups, which is great when you are dining with children as the waiting is always the worst part and when they are likely to get the most annoyed! I was sharing my food with O so wanted something I knew he’d enjoy too. 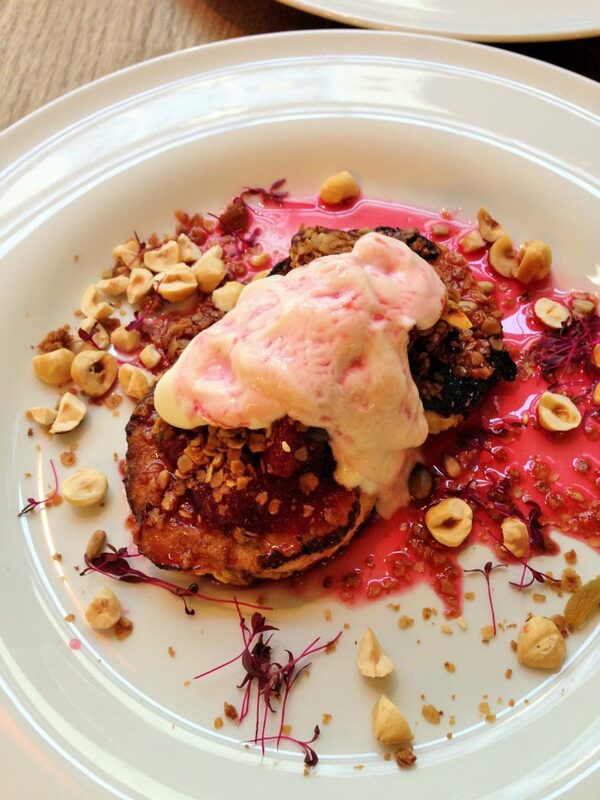 I opted to try the French toast, poached plums, hazelnuts and crème fraiche. There was more than enough for the two of us, of course I scoffed all the nuts and crème fraiche as O can’t have dairy, or nuts of course! 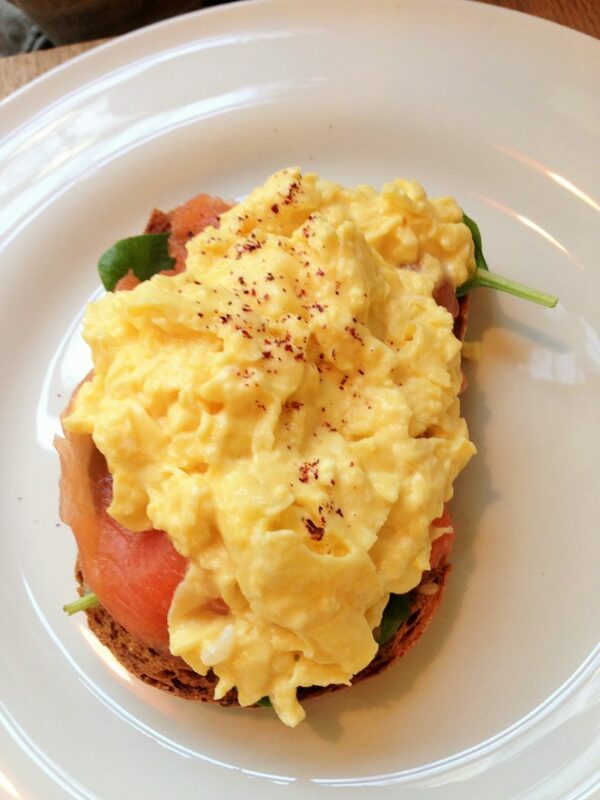 Gemma chose the Smoked salmon, scrambled eggs and malt toast. Both meals were just delicious and there wasn’t a bad word to say about it from either of us grown ups. The only complaint came from O as I wasn’t feeding him fast enough. I’d been loading a fork for him, but he quickly took matters into his own hands! One thing I need to mention about the food is that Waterloo Tea are very ‘allergy aware’. They try to make their tea houses accessible to all and stock gluten free bread and use dairy free spreads. A lot of their cakes (which are baked by local home bakers) are gluten free and they also stock dairy free (and vegan) ones too. You just need to ask and they will create a meal for you that is safe whilst still being delicious. Also if you want afternoon tea, that you are best booking the day before anyway, if you tell them you need it gluten/dairy free they will make it especially for you. 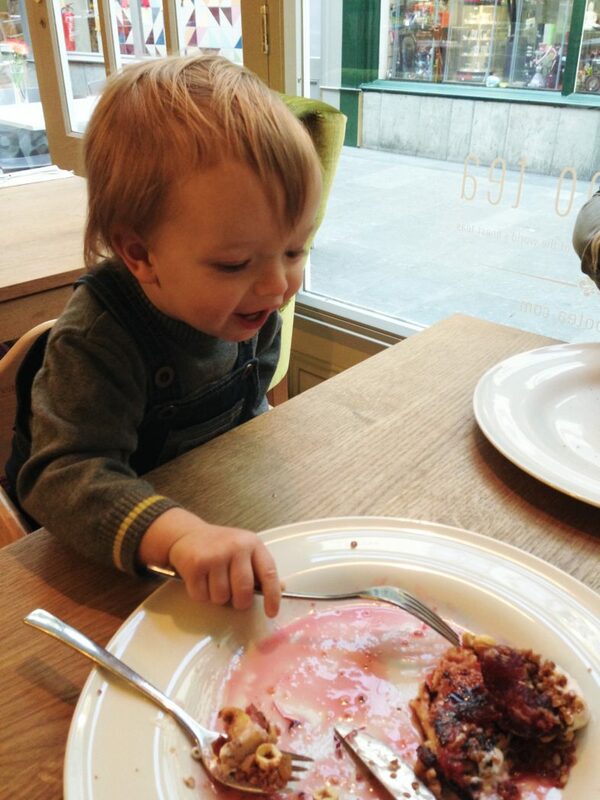 They are also happy to try and make something your child will eat if there is nothing suitable on the menu! Throughout our entire visit O was kept occupied by the staff members walking back and forth past our table. Not one of them went by without stopping to speak to him. He revelled in all the attention and they truly seemed to love chatting to him. At one point the manager, who looked like he was having a meeting with a member of staff, ended up playing peekboo around a vase because O kept shouting hiya (at the top of his voice) at him until he paid attention, cheeky boy that he is! While Gemma and I gossiped and finished our tea, I gave O something to keep himself occupied (other than stopping the staff working). 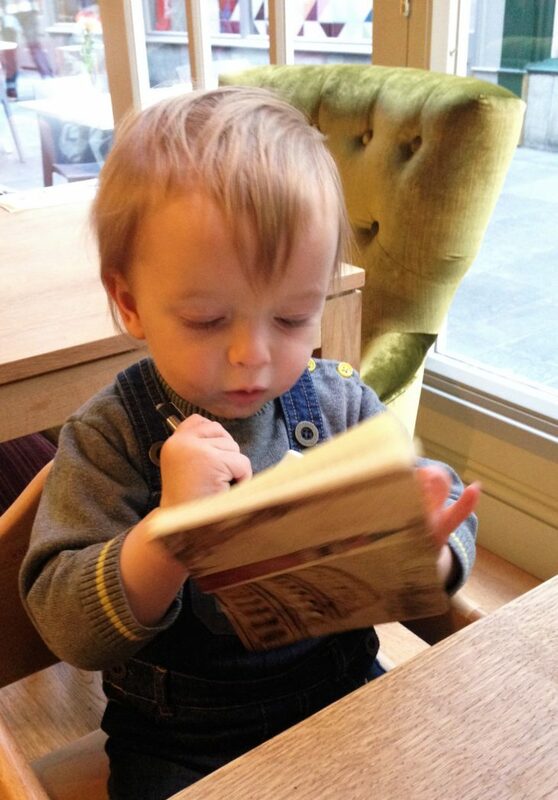 We’ll never know, but maybe he was writing his own review! As I was looking back on the photo’s, this one really tickled me. It’s a lovely photo of Gemma but can you guess which side of the table O is sitting on? Waterloo Tea, and every single staff member I have met so far, really do have the right attitude to customer care. From the moment we arrived to when we walked out the door we were made to feel at ease and completely welcome. Even the fact that O doesn’t understand the concept of ‘inside voices’ wasn’t an issue. If you are ever in Cardiff and fancy a cuppa and something tasty, yet healthy, to eat. I truly recommend you stop by Waterloo Tea House in Wyndham Arcade! Disclaimer: We received a complimentary meal (courtesy of Millenium Hotels) for the purposes of this review. However all thoughts and opinions are honest and my own.